Area 5-4 is the fifth course of Sandstorm Steps and the forty-first course overall in Mario vs. Donkey Kong: Mini-Land Mayhem!. The Mini Marios begin near the top right on a platform on the middle level, with the exit door just below them. In order to reach it, they must be guided to the slope guarded by a Shy Guy. The M-Token is located near the top right, atop a Girder on the upper level. To collect it, a Mini must simply follow a Blue Ladder up to it while exiting the upper Warp Pipe entrance on the other side. 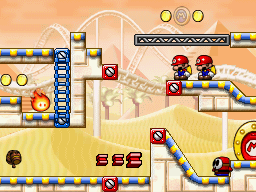 The Mini Mario Card is located on the middle left, atop a platform on the middle level between the two Warp Pipe entrances. A Mini Mario must climb down a Blue Ladder while narrowly avoiding the Fire to reach it.